VeloPress is pleased to announce the release of The 2006 Tour de France: Triumph and Turmoil for Floyd Landis. John Wilcockson and the editors of VeloNews magazine clearly explain the 2006 Tour from the sting operations that fractured the peloton just hours before the prologue, to Landis's stunning crack on stage 16 and miraculous recovery, to the controversial aftermath of the doping scandals. Fans of cycling's greatest race can finally arrive at an informed opinion of the 2006 Tour. The book is available now through VeloGear.com and major bookstores. It was the greatest ride in Tour history . . . or the worst betrayal the Tour has ever known. The 2006 Tour de France saw an unforgettable ride by Floyd Landis, where he regained more than seven minutes on race leader Oscar Pereiro and positioned himself for final victory. But days later Landis's win was called into question when a post-stage drug test was declared positive. With accusations flying on all sides, cycling fans need an insider to follow the aftermath. 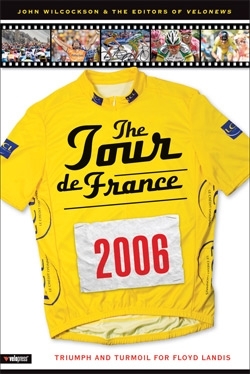 The 2006 Tour de France is an eye-opening read on the most unpredictable Tour ever. Drawing on the unique access of John Wilcockson and the VeloNews editorial team, The 2006 Tour de France has it all: behind-the-scenes stories, exclusive interviews, informed analysis, and the expert perspective required to sort fact from fiction. The book includes brilliant color photography, detailed stage maps and course profiles, and stage-by-stage reports. VeloPress is an endurance sports publisher focusing on the sports of cycling and triathlon, with training books that help both serious athletes and beginners build skills and fitness. VeloPress also publishes historical and biographical books that take a closer look at the celebrated athletes and personalities in our sports. VeloPress authors are trusted experts in coaching, gear, maintenance, nutrition, and history. VeloPress is the book publishing division of Inside Communications, Inc., publisher of VeloNews and Inside Triathlon magazines.